“It's 2052, and there's one less state in the union. Texas, now known as the Republic of Texas, has seceded, just like it did in 1861, though for different reasons this time. 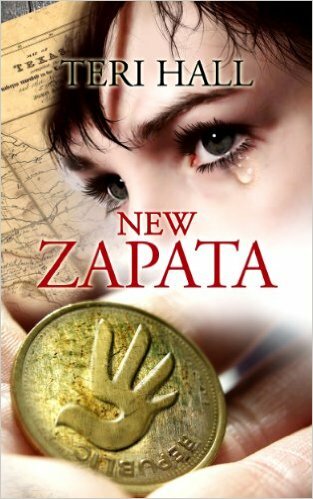 Rebecca lives in New Zapata, a border town in The Republic of Texas. She's nineteen years old, born and raised in the R of T, and doesn't remember a time when things were different, though her Aunt Cathy does. Rebecca's married to Chad, the boy who charmed her into an unplanned pregnancy. She loves her young son, Luke, but she almost died giving birth to him. Teri Hall lives in Washington State with her two cats and a dog. She’s the author of two other books, The Line and Away, which are the first two books in a traditionally published YA Fantasy series. She was supposed to be writing the third in that series, but current events moved her to take time out to write and self-publish this first. Dystopian fiction, besides taking place in a society that is the opposite of a utopia, typically explores some of the reasons that things are so bad. An example familiar to many is Orwell’s 1984. Usually these reasons are related to current real world issues and extrapolate what the results of continuing in a particular direction might be. New Zapata does exactly that, taking aim at recent attempts in the US to decrease the rights women have over their own reproductive systems. When a novel takes a political stance, which is almost always going to be the case with this genre, and it’s on a current issue where emotions run high, as with this one, some authors focus too hard on making their case and not hard enough on telling the story well. When that happens, even if the reader’s politics make them sympathetic to the message, the book is still going to be a failure. I’ve previously read two books that attempted to tackle this same issue. In spite of agreeing with the authors’ politics and wanting them to be successful making their point, both those books fell short. New Zapata didn’t. There are several reasons why. The most obvious reason this story worked is the author resisted the urge to preach and concentrated on telling the story. The premise didn’t stretch credibility too far (I’d guess there are even a fair number of people who think this result would be a good one). How women reacted was very believable, not unlike how different oppressed groups have reacted in other places and times. I loved the characters, especially Rebecca and her aunt, was pulling for them, and the story got me thinking. Can’t ask for more than that. Added for Reprise Review: Winner in the Speculative Fiction (excluding fantasy) category for 2014 Readers' Choice Awards at BigAl’s Books and Pals. Original review ran October 11, 2013. Very few issues although there is a consistent problem with using the word current, as in right now, instead of the word currant (a dried fruit you eat).